Your wedding party members are your VIPs, so treat them like it when you "propose". These puzzles are a unique and fun way to ask them; let them build it and read the big question! 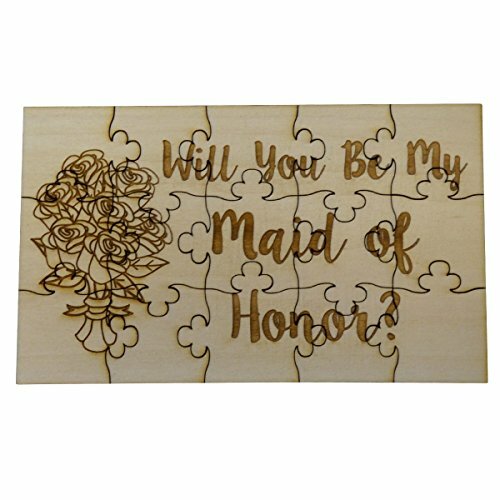 - Dimensions: 6" x 3.5"
UNIQUE GIFT: Your wedding party members are your VIPs, so treat them like it when you "propose"
FRAME AFTER ASSEMBLING: Jigsaw Puzzle has 15 pieces and measures 6" x 3.5". Can be glued together using wood glue and framed for a keepsake! SATISFACTION GUARANTEED: We are a US-based, family-owned business that promises superior customer service including excellent communication and easy returns.